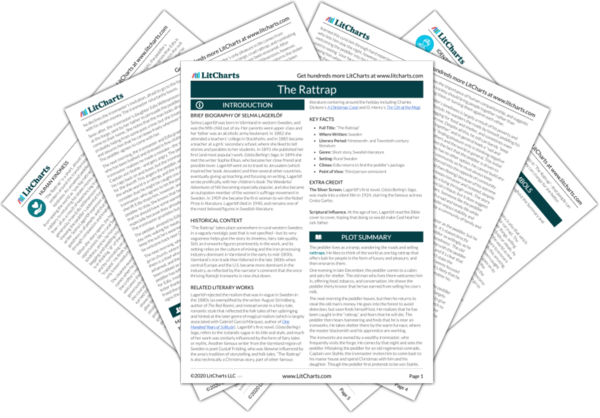 Instant downloads of all 946 LitChart PDFs (including The Rattrap). 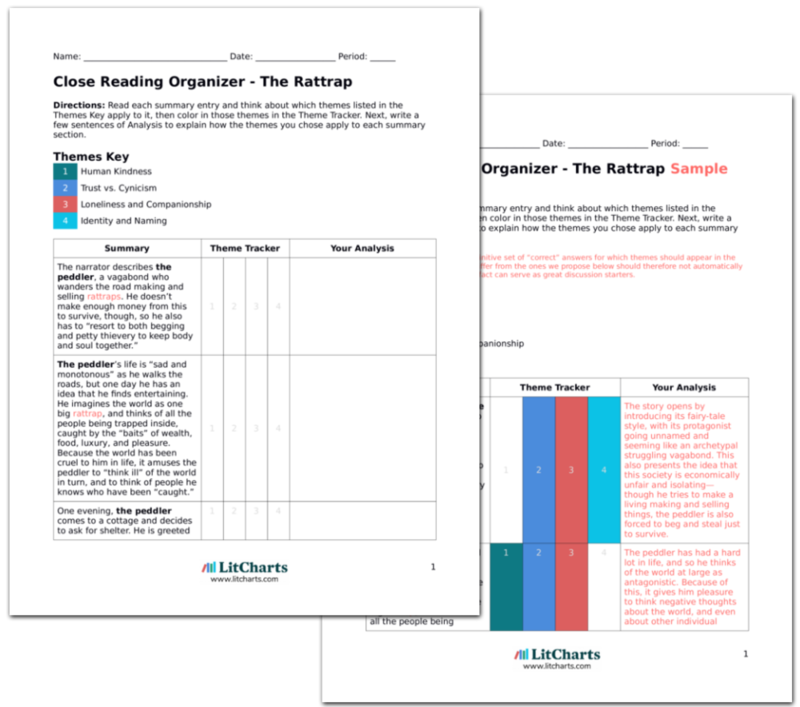 Welcome to the LitCharts study guide on Selma Lagerlöf's The Rattrap. Created by the original team behind SparkNotes, LitCharts are the world's best literature guides. A concise biography of Selma Lagerlöf plus historical and literary context for The Rattrap. A quick-reference summary: The Rattrap on a single page. In-depth summary and analysis of every of The Rattrap. Visual theme-tracking, too. Explanations, analysis, and visualizations of The Rattrap's themes. The Rattrap's important quotes, sortable by theme, character, or . Description, analysis, and timelines for The Rattrap's characters. Explanations of The Rattrap's symbols, and tracking of where they appear. An interactive data visualization of The Rattrap's plot and themes. Selma Lagerlöf was born in Värmland in western Sweden, and was the fifth child out of six. Her parents were upper-class and her father was an alcoholic army lieutenant. In 1882 she attended a teachers’ college in Stockholm, and in 1885 became a teacher at a girls’ secondary school, where she liked to tell stories and parables to her students. In 1891 she published her first (and most popular) work, Gösta Berling’s Saga. In 1894 she met the writer Sophie Elkan, who became her close friend and possible lover. Lagerlöf went on to travel to Jerusalem (which inspired her book Jerusalem) and then several other countries, eventually giving up teaching and focusing on writing. Lagerlöf wrote prolifically, with her children’s book The Wonderful Adventures of Nils becoming especially popular, and also became an outspoken member of the women’s suffrage movement in Sweden. In 1909 she became the first woman to win the Nobel Prize in literature. Lagerlöf died in 1940, and remains one of the most beloved figures in Swedish literature. 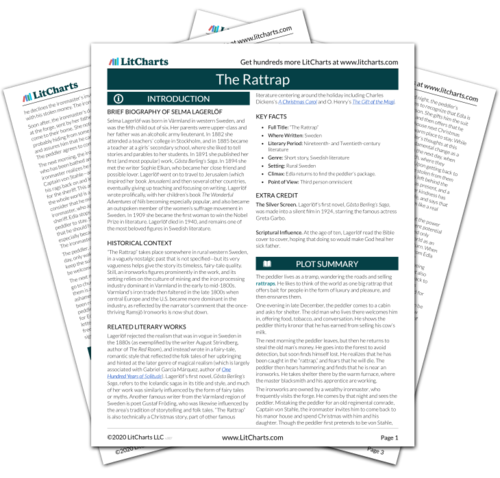 Get the entire The Rattrap LitChart as a printable PDF. “The Rattrap” takes place somewhere in rural western Sweden, in a vaguely nostalgic past that is not specified—but its very vagueness helps give the story its timeless, fairy-tale quality. Still, an ironworks figures prominently in the work, and its setting relies on the culture of mining and the iron processing industry dominant in Varmland in the early to mid-1800s. Varmland’s iron trade then faltered in the late 1800s when central Europe and the U.S. became more dominant in the industry, as reflected by the narrator’s comment that the once-thriving Ramsjö Ironworks is now shut down. Lagerlöf rejected the realism that was in vogue in Sweden in the 1880s (as exemplified by the writer August Strindberg, author of The Red Room), and instead wrote in a fairy-tale, romantic style that reflected the folk tales of her upbringing and hinted at the later genre of magical realism (which is largely associated with Gabriel García Márquez, author of One Hundred Years of Solitude). Lagerlöf’s first novel, Gösta Berling’s Saga, refers to the Icelandic sagas in its title and style, and much of her work was similarly influenced by the form of fairy tales or myths. Another famous writer from the Varmland region of Sweden is poet Gustaf Fröding, who was likewise influenced by the area’s tradition of storytelling and folk tales. “The Rattrap” is also technically a Christmas story, part of other famous literature centering around the holiday including Charles Dickens’s A Christmas Carol and O. Henry’s The Gift of the Magi. Climax: Edla returns to find the peddler’s package. The Silver Screen. Lagerlöf’s first novel, Gösta Berling’s Saga, was made into a silent film in 1924, starring the famous actress Greta Garbo. Scriptural Influence. At the age of ten, Lagerlöf read the Bible cover to cover, hoping that doing so would make God heal her sick father. Cosby, Matt. "The Rattrap." LitCharts. LitCharts LLC, 9 Nov 2018. Web. 11 Dec 2018. Cosby, Matt. "The Rattrap." LitCharts LLC, November 9, 2018. Retrieved December 11, 2018. https://www.litcharts.com/lit/the-rattrap.